OnCue allows users to use different highlighter colors of transcript text to give a visual representation of sets of designations. This allows different groups of designations to be identified for whatever purpose needed. For example, a reviewer may want a specific color for Plaintiff's designations and a different color for the Defense's designations. Or for another List, a reviewer may want one color for one topic and another color for a different topic. Up to 8 colors allow plenty of variables if the reviewers need to get more specific (e.g., Plaintiff Affirmatives, Plaintiff Counters, Plaintiff Optional Completeness, Defense Affirmatives, Defense Counters, etc.). These colors will appear in the Transcript Viewer pane and on designation reports. 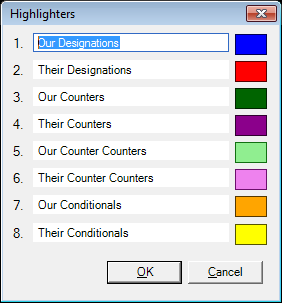 The highlighter colors can be edited by right-clicking the Transcript Viewer pane and selecting "Set Highlighter Colors". A new Window will pop up where you can choose the colors and name the descriptions. Note the number in the left column. This is the highlighter number and will be used in creating Designation List imports and also determines the "Sort by Highlighter" sequence. Changing a color here changes the color globally. In other words, if you change the color for #2 here to yellow, anything in the database that has been designated with highlighter 2 will have its text changed to yellow. Keep in mind that the Designation List reports show the text as the color you choose so pay close attention as to whether it will be readable or not.